Inside bar breakout strategies are one of the most robust strategies to trade in strongly trending ‘runaway’ markets. 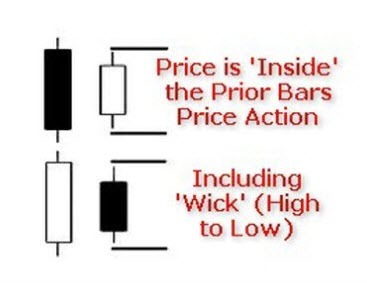 An inside bar is a bar that forms totally within the trading range of the preceding bar and indicates market uncertainty before the next volatility expansion move higher or lower. The best way to play Inside Bar Breakouts is to bracket the high and low of the inside bar with stop orders: A BUY stop 1 pip above the high, and a SELL stop 1 pip below the low. Whichever stop fills first marks trade entry, the remaining stop order serves as risk protection. Following trade entry there are a number of ways to manage the position. We choose to split our trades into multiple units: exiting 1/2 our trade at one unit of risk (equal to the width of the inside bar), thereafter scaling out using multiple profit taking targets based on a percentage of recent volatility. Trade only very ‘narrow range’ inside bar breakouts where the range of the inside bar is lower than the lowest range of the preceding 5 trading sessions. Trend Filter: trade only in the direction of the established medium term trend using combination moving average filters and ADX. Only Buy breakouts in the direction of the established medium term up trend if we are currently short term oversold. Only Sell breaks in the direction of the established medium term down trend if we are currently short term overbought. Trade only in the direction of our Forex Intermarket Trading Signals. The important thing to remember is that because we are using relatively small stop orders there will be a proportionately large number of small contained losing trades, many average sized wins, and a few HUGE out-sized gains. By the nature of the trade distribution this setup is difficult for many traders to follow! Filters can help increase our winning trade percentage and make the strategy more tolerable to trade and we will look at each these Inside Bar filters in greater detail in future Blog updates and in our Forex Strategy Pages.